Want to skip to the results? View the Shady Knoll’s website HERE. 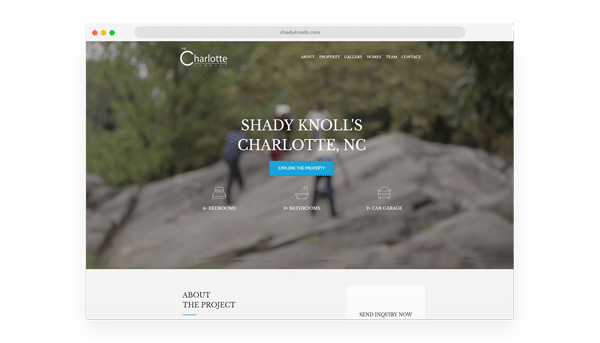 When approached by Shady Knoll’s Homes to build a website to not only compliment, but also show off their stunning project of fourteen 3000-3500 sq ft homes in Shady Knoll, Charlotte NC, we couldn’t wait to get started. With a project this large, the client required a website that would sell visitors on the local area just as much as the homes themselves. Being our first website build project around real estate, let alone real estate in the United States, we set about researching the local market. Once we’d established a strong understanding of the local competition, what information consumers expect to find, and what helps sell the homes; we set to building a wire frame layout of the website. This helped both parties involved understand clearly, what content goes where. Nicolas (Managing Partner of parent company The Charlotte Company) knows exactly what he wants, and we had no problem going back and forth a handful of times to perfect his goal. The back and forth was worth it. In the end, the result it a sleek website that clearly gets across exactly what was wanted. Information around the community, location, the homes and even a peek into the build process. It’s been a great pleasure working on this project, and there will most definitely be more to come from The Charlotte Company. To view the Shady Knoll’s Homes website, just click HERE.